Puma Punku, truly startles the imagination. It seems to be the remains of a great wharf (for Lake Titicaca long ago lapped upon the shores of Tiahuanaco) and a massive, four-part, now collapsed building. One of the construction blocks from which the pier was fashioned weighs an estimated 440 tons (equal to nearly 600 full-size cars) and several other blocks laying about are between 100 and 150 tons. that could have transported stones of such massive weight and size. The Andean people of 500 AD, with their simple reed boats, could certainly not have moved them. Even today, with all the modern advances in engineering and mathematics, we could not fashion such a structure. Just out of the aerial picture (Right) to the bottom left is the site of the Puma Punku. This is another ‘temple area’ with many finely cut stones some weighing over 100 tonnes. Its position to the south of the Akapana may have been important because it gave a good view to a sacred mountain far to the east. Of course there is no certainty that this was the reason as the ancient builders left no written records. Puma Punku doesn’t look impressive: a hill as remains of an old pyramid and a large number of megalithic block of stone on the ground, evidently smashed by a devastating earthquake. However, closer inspection shows that these stone blocks have been fabricated with a very advanced technology. Even more surprising is the technical design of these blocks shown in the drawing below. All blocks fit together like interlocking building blocks. A wall of the Akapana, the pyramid of Tiahuanacu, shows similar modular design. Blocks that are piled one on top of the other but the underside of the upper stone is cut at an angle. 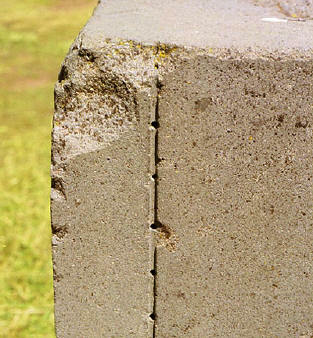 The top of the standing stone is cut at the same angle, as shown on the figure below. The architectural achievements seen at Pumapunku are striking in light of the presumed level of technological capability available during its construction. 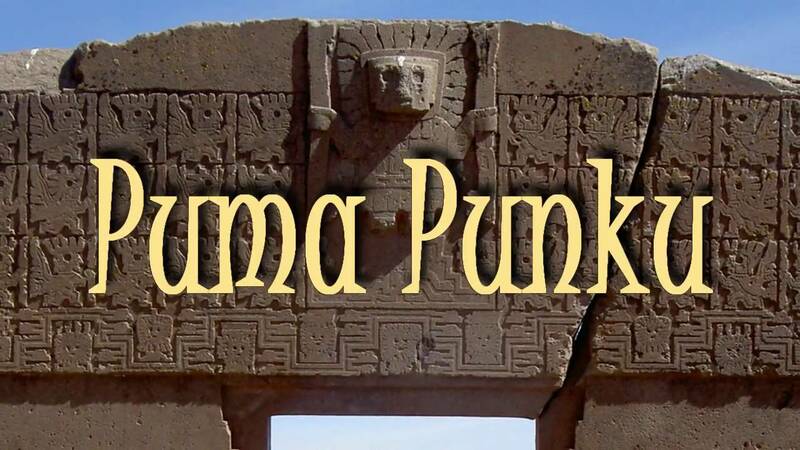 Due to the monumental proportions of the stones, the method by which they were transported to Pumapunku has been a topic of interest since the temple’s discovery. The largest of these stone blocks is 7.81 meters long, 5.17 meters wide, averages 1.07 meters thick, and is estimated to weigh about 131 metric tons. The second largest stone block found within the Pumapunka is 7.90 meters long, 2.50 meters wide, and averages 1.86 meters thick. Its weight has been estimated to be 85.21 metric tons. Both of these stone blocks are part of the Plataforma Lítica and composed of red sandstone. Based upon detailed petrographic and chemical analyses of samples from both individual stones and known quarry sites, archaeologists concluded that these and other red sandstone blocks were transported up a steep incline from a quarry near Lake Titicaca roughly 10 km away. Smaller andesite blocks that were used for stone facing and carvings came from quarries within the Copacabana Peninsula about 90 km away from and across Lake Titicaca from the Pumapunka and the rest of the Tiwanaku Site.